anti-bacterial agent. One of my nursing friends caught on right away, but I still had to check it out. It only took a few searches to uncover the truth, however. It turns out that the history and extent of use of antibacterial silver for medical and water purification has been known for centuries. It's longest-known use has been as a water purification agent. Ancient sea-faring civilizations recognized that if they stored water or wine in silver jugs they stayed fresh longer - especially important when traveling on salt-water oceans. Remember back when people bought babies silver cups and cutlery? What we think of as a quaint tradition has a totally practical purpose - believing that the silver would keep the food/beverages fresher and healthier, and that the baby would be less exposed to disease. This antibacterial silver application started long before people even knew what bacteria were. About the same time I was doing this research I also ran into silver impregnated band-aids on the pharmacy shelf. A little more research uncovered the common hospital use of silver in bandages for treating serious burns. 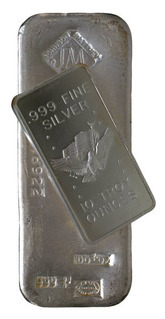 Silver is also used in water purification systems and for disinfecting medical instruments. Although this is less supported by research, some people also take 'colloidal silver' internally to fight infections. Right now a very popular form of silver being used for antibacterial purposes is 'nano-silver'. The molecules are much smaller than micro-silver. This makes it much more 'available' but also an unnecessary danger to the environment, as it is more easily released into the ground water, where it continues to kill good bacteria along with the bad - a serious issue. So, it's preferable to stick with micro rather than nano silver consumer products.